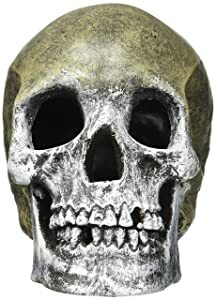 Do you have any idea for Halloween day? 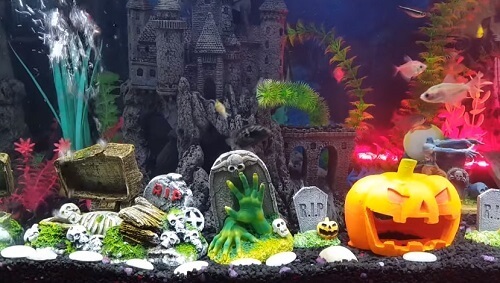 Why not create a creepy Halloween aquarium theme for the spookiest time of year? 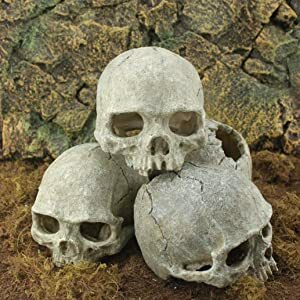 Think about it, all your friends will be focusing on decking their halls and lawns with pumpkins and skeletons, and almost no one will think about designing an awesome aquarium theme where the fish swim with the undead. How to prepare for non aquarium decorations? Let’s start off with the ultimate Halloween theme, the graveyard. 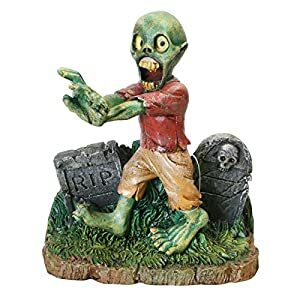 For setting up this theme, you will need some graves (tombstones), fences, and zombies. You can replace the zombies with skeletons or skulls, or use all of them if you own a large fish tank. 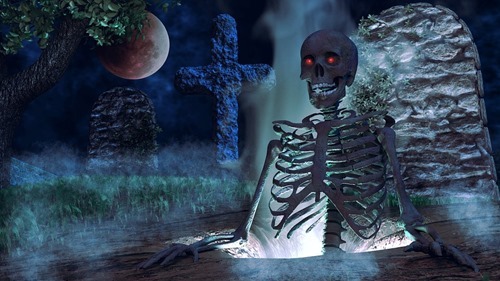 Halloween graveyard – Image from Pixabay. 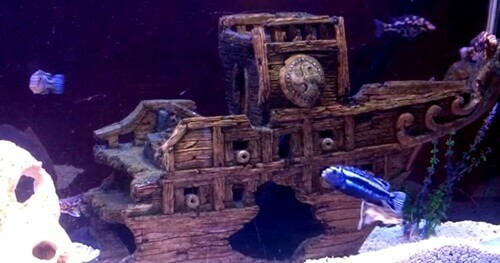 Firstly, scattering the graves around the bottom of your fish tank to make a graveyard. They do not need to be arranged in neat rows. If you use a fine black substrate, it is ideal to make a bulge in front of each grave stone to replicate a grave. 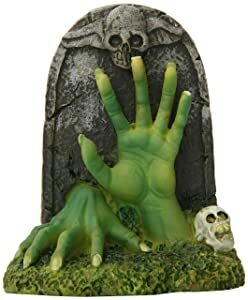 Next, placing zombies and skeletons just in front of the grave stones to make the feel that they are climbing out of their graves. Finally, arranging the fences around the grave stones to make a graveyard. 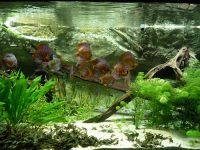 What you would put into your aquarium depends largely on how big your tank is. 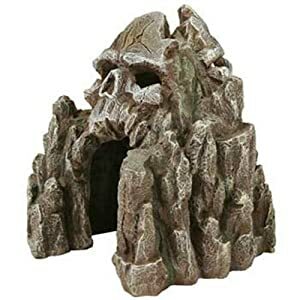 For small aquariums under 10 gallons, a tombstone, a zombie and some fences are enough for the graveyard theme. 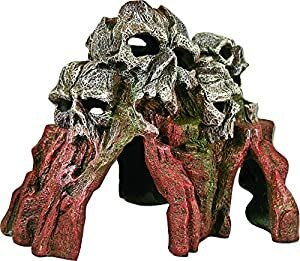 For medium sized fish tanks (20 – 55 gallons), you would do the same as above but you could also add to the theme some scary trees to give it a better effect. 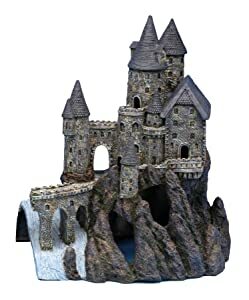 If your aquarium is large, you could also add to it a skull mountain or a large castle in the background. The great feature of this design is that it is relatively low and will not affect the swim space of your fish. 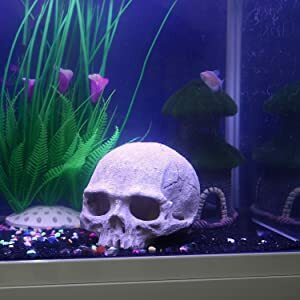 If you want a background for the spooky effect, you could make your own or buy a Halloween background to perfect the look of your aquarium. Besides, you can use soft, blueish aquarium LED lighting to make it look even more spine chilling. 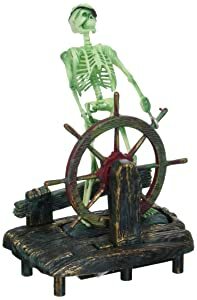 There aren’t many aquarium decorations that is specifically created for Halloween. 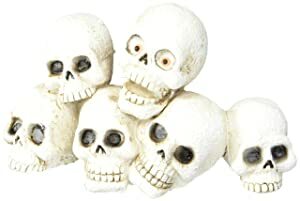 However, we can absolutely use other resin or clay Halloween ornaments for aquarium uses, with a little bit of preparation. 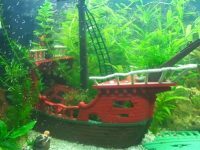 Alternatively, we could also mix and match existing fish tank decorations from various themes such as pirates and sunken ships for the Halloween theme. There are a number of issues if you use ornaments that were not meant to be aquarium decorations. 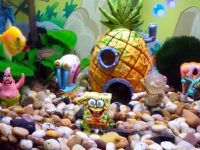 Before deciding if an decoration can be directly added into your aquarium, you should inspect the item thoroughly and make sure all the materials used to make it are durable in water environment. Give your attention to metal parts that are easy to rust underwater. Any metal part, no matter how tiny needs to be removed. Another important issue to consider is how the decoration is colored. If the paint is moulded onto the item, then it is fine. But in most cases, house decorations are hand painted and the paint could potentially leak into the aquarium water. For ornaments that are hand-painted or made with less suitable materials, what you can do is to coat them thoroughly in a transparent silicone membrane. This will prevent the water from contacting with the decorations and destroying them. 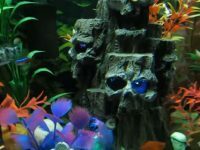 A Halloween theme for your aquarium will create a unique addition to your Halloween decor. 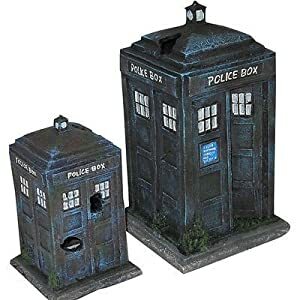 Just scanning through any online store will tell you that there are virtually no many fish tank decorations specifically for this holiday. That mean you would have a design that no one else will have. Use the aquarium decorations above to create a theme that will make you the talk of the town for a long time to come.